Blobs of oil and balls of tar washed ashore in northwestern England last week. 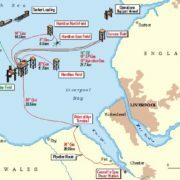 The oily litter impacted a 15 kilometer stretch of coastline and originated from an OSI (offshore storage installation) that receives oil from the Douglas Complex, an offshore triple-platform central to the Liverpool Bay oil and gas production operations seen below. 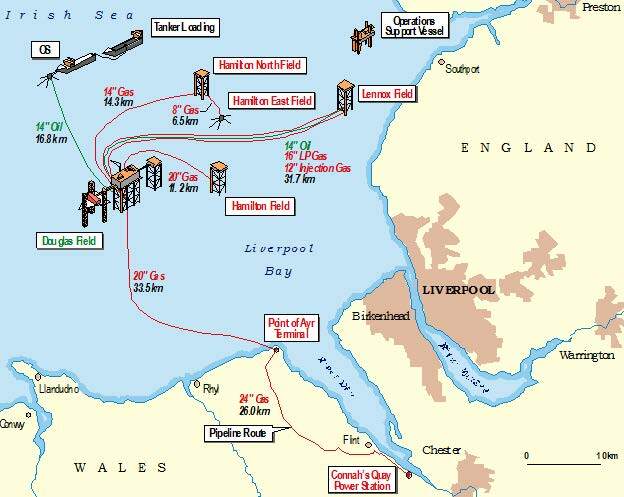 The Liverpool Bay oil & gas infrastructure funnels through the Douglas Complex (ENI Liverpool Bay Operating Company, 2016). From eni Liverpool Bay Operating Company 2014 Environmental Statement. The Douglas Complex is integral to the Liverpool Bay’s network because all oil and gas collected by its four satellite sites (Lennox, Hamilton, Hamilton East, and Hamilton North) is funneled through the Complex for processing. Natural gas products are then re-directed ashore to the Point of Ayr Gas Terminal and crude oil to the OSI. It was this latter-most connection, an oil tanker anchored in place, that failed in Liverpool Bay on July 10, 2017. Radar imagery from ESA’s Sentinel-1 satellite appears to show the slick resulting from this spill, as it drifts away from the storage tanker and heads toward shore. ASCAT satellite-derived surface wind data from the time of the spill confirms the wind was blowing from the north and east, consistent with the trajectory seen in these images. A spokesperson claimed that between 630-6,300 gallons of oil leaked; our conservative estimate, based on the size of the slick and an assumed average thickness of 1 micron, show this to be at least 6,843 gallons. Also note the half-mile gap between the OSI and a safety response vessel, the Vos Inspirer, on July 11 in the image that matches AIS vessel tracking data. An educated guess would be that the leak originated under water, potentially from the pipeline leading from the Douglas Complex, from the riser pipe from the seafloor to the OSI, or from the seafloor junction between the two. Radar imagery from ESA’s Sentinel-1 satellite appears to show the slick resulting from this spill, as it drifts away from the storage tanker and heads toward shore. ENI, the Italian oil firm that accepted responsibility for the Liverpool Bay oil spill was recently granted access to drill for oil in US waters in Alaska’s Beaufort Sea. This approval comes on the back of President Trump’s executive order that recently reversed a permanent ban on new offshore drilling. The policy change has faced substantial criticism from environmental heavy-weights, culminating in a lawsuit filed by Earthjustice, NRDC, Center for Biological Diversity, League of Conservation Voters, REDOIL, Alaska Wilderness League, Northern Alaska Environmental Center, Greenpeace, Sierra Club, and The Wilderness Society to challenge the executive order’s legality. ENI might learn from Shell Oil’s failures. Shell canned a $7 billion offshore drilling project in Alaska’s Chukchi Sea after determining it was not financially worthwhile. Economic risk factors are furthered by International Energy Agency reports of an oil-supply “glut” and lowering crude prices amidst the rise of both renewable energy, and cheaper oil produced by fracking onshore. Between supply-side risk, threats of lawsuits, and low oil prices, ENI is diving head first into a complicated, high-risk pool. Off the Fylde coast, authorities were quick to execute a plan after locals immediately brought the situation to their attention. As the Coast Guard continues to advocate for the basic resources needed for emergency preparedness and response in the Arctic, is this a gamble worth taking?